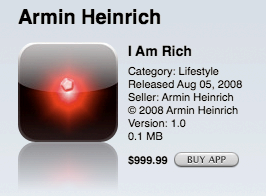 The Apple app store once sold an "I Am Rich" application, It cost $999.99 to purchase and did nothing. The application is described as "a work of art with no hidden function at all", with its only purpose being to show other people that they were able to afford it, making it a Veblen good. I Am Rich was sold on the App Store for 999.99 United States dollars, 799.99 euros, and 599.99 pounds sterling, the highest price Apple allows for App Store content. The application was removed from the App Store by Apple Inc. without explanation the day following its release, on August 6, 2008. While the application was available, eight people bought it, at least one of whom claimed to have done so accidentally. Six US sales at $999.99 and two European ones for €799.99 netted between $5,600–5,880 for developer Armin Heinrich and $2,400–2,520 for Apple. In correspondence with the Los Angeles Times, Heinrich told the newspaper that Apple had refunded two purchasers of his app, and that he was happy not to have dissatisfied customers.